Security Council meeting: Maintenance of international peace and security. Nuclear non-proliferation and nuclear disarmament. 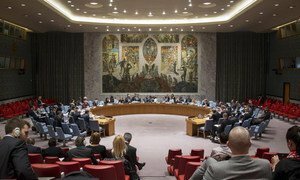 Reaffirming that proliferation of weapons of mass destruction, and their means of delivery, threatens international peace and security, the United Nations Security Council today adopted a resolution urging all States who haven't done so to sign the Comprehensive Nuclear-Test-Ban Treaty. With 14 votes in favour and one abstention (Egypt), the resolution welcomed progress made towards universalization of the Treaty, noting that 183 States have signed the Treaty and 166 States have deposited their instruments of ratification. The Comprehensive Nuclear-Test-Ban Treaty bans all nuclear explosions for both civilian and military purposes. Adopted by the UN General Assembly under resolution 50 (1996), the Treaty will enter into force 180 days after the date of deposit of the instruments of ratification by all States listed in its Annex 2. Speaking to the press shortly after the Council voted on the resolution, Lassina Zerbo, the Executive Secretary of the Comprehensive Nuclear-Test-Ban Treaty Organisation (CTBTO), the Treaty's Preparatory Commission, said the organisation welcomed any initiative that serves to strengthen the norm against nuclear testing. "This is timely, said Mr. Zerbo. "This resolution is timely because it comes at a time where we celebrate the 20 years anniversary of the opening for signature, of the Comprehensive Nuclear-Test-Ban Treaty, but timely as well because it comes at a time where DPRK (Democratic People's Republic of Korea) has reminded the international community of the absolute necessity to get this treaty into force, by having the moratorium on nuclear testing strong and sealed," Mr. Zerbo added. He was referring to the latest incident of nuclear testing -- conducted by DPRK -- which was condemned by CTBTO, the UN Secretary General, the Security Council, and the International Atomic Energy Agency (AIEA). Mr. Zerbo also noted that voting today and adopting the resolution, keeps the Comprehensive Test-Ban Treaty relevant. "We understand some of the concerns that States may have, that this does not substitute the process for ratification. The process for ratification remains the ultimate way to get the Treaty into force, but we just hope that this step - which is an important step, because after the Iran deal, this constitutes one next key element in arms control, non-proliferation and ultimately disarmament - we hope that there will be more steps towards disarmament, because we all seek a world free of nuclear weapons at the end of the day," said Mr. Zerbo. Today's resolution – adopted by the 15-member Council at a meeting on maintenance of international peace and security – further noted that of the 44 States listed in Annex 2, 41 have signed and 36 have both signed and ratified the Treaty, including several nuclear weapons States. Of the 44 States included in Annex 2, all have signed with the exceptions of the Democratic People's Republic of Korea, India and Pakistan. Five of the 44 Annex 2 States have signed but not ratified the Treaty: China, Egypt, Iran, Israel and the United States. Stressing the “vital importance and urgency” of achieving the early entry into force of the Treaty, the Security Council, by the terms of the resolution, urged all States that have either not signed or not ratified the Treaty – particularly the eight remaining Annex 2 States – to do so without further delay. Further, the Security Council called on all States to refrain from conducting any nuclear-weapon test explosion or any other nuclear explosion, and to maintain their moratoria in that regard, and to provide the required support to enable the Preparatory Commission for the Comprehensive Nuclear-Test-Ban Treaty Organization to complete all of its tasks in the most efficient and cost-effective way. By the text of the resolution, the Council also recognized that “even absent entry into force of the Treaty the monitoring and analytical elements of the verification regime are at the disposal of the international community in conformity with the Treaty and under the guidance of the Preparatory Commission.” Such elements “contribute to regional stability as a significant confidence-building measure, and strengthen the nuclear non-proliferation and disarmament regime,” the Council said. In addition, the Council affirmed that the Treaty's entry into force will contribute to the enhancement of international peace and security through its effective prevention of the proliferation of nuclear weapons and through its contribution to nuclear disarmament. A landmark international treaty opened for signature in 1968, the Treaty on the Non-Proliferation of Nuclear Weapons entered into force in 1970, and was extended indefinitely on 11 May 1995. Its objective is to prevent the spread of nuclear weapons and weapons technology, promote cooperation in the peaceful uses of nuclear energy, and further the goal of achieving nuclear disarmament and general and complete disarmament. It represents the only binding commitment in a multilateral treaty to the goal of disarmament by the nuclear-weapon States.